FireFlow Services Inc is one of the area's leading companies in fire hose testing. When you choose to use FireFlow Services, you will feel confident that the job will be professionally done, on time, and we guarantee you'll love the way everything looks when we leave. Recording all hose according to size, length, manufacturer, age and pressure test. 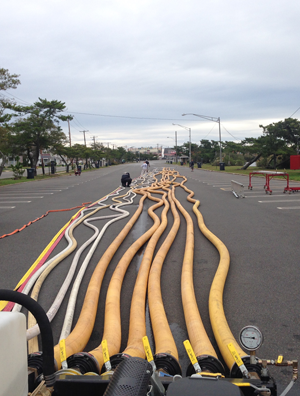 Recording results of each hose length tested for NFPA compliance and insurance certification. When we are done, you will be pleased on the parade pack that we are famous for. So, when it's time to go, your fire hose is ready to go. NFPA allows for a maximum test length of 300 ft.
Any hose that cannot be repaired should have both couplings removed and marked "out of service".